Directions (1 – 5): Study the following information carefully and answer the given question. 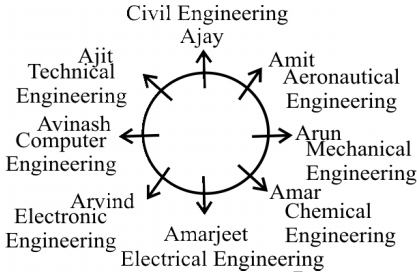 Amit, Arun, Ajay, Arvind, Amar, Amarjeet, Avinash and Ajit are eight friends studying in engineering colleges in different streams, viz Aeronautical Engineering, Computer Engineering, Chemical Engineering, Electronic Engineering, Electrical Engineering, Civil Engineering, Mechanical Engineering and Technical Engineering, but not in the same order. 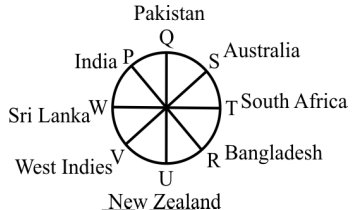 All of them are seated around a circular table, facing away from the centre. Amit sits third to the left of the person who studies Electrical Engineering. Only two persons sit between Amar and Avinash. Neither Amar nor Avinash studies Electrical Engineering. The person who studies Technical Engineering sits second to the right of Arvind. Arvind is not an immediate neighbour of Amit. Arvind does not study Electrical Engineering and Amit does not study Technical Engineering. The one who studies Aeronautical Engineering sits third to the left of Amarjeet. The one who studies Aeronautical Engineering and the one who studies Electrical Engineering are not immediate neighbours. Only one person sits between Arvind and the one who studies Chemical Engineering. The person who studies Electronic Engineering and the one who studies Computer Engineering are immediate neighbours. Only one person sits between Arun and the one who studies Civil Engineering. The one who studies Civil Engineering is an immediate neighbour of Ajit. Avinash and Arun are not immediate neighbours. Arvind does not study Computer Engineering. 1. How many people sit between Amar and the one who studies Civil Engineering (when counted in clockwise direction from Amar)? 2. Who studies Aeronautical Engineering? 3. Which of the following combinations is definitely true? 4. Who studies Chemical Engineering? 5. What is the position of the person who studies Mechanical Engineering with respect to Ajay? 6. Who among the following sit exactly between Q and the captain of West Indies? 7. Who among the following is the captain of Australia? 8. Four of the following five are alike in a certain way based on the given arrangement and thus form a group. Which is the one that does not belong to that group? 9. Who among the following sits second to the left of the captain of India? 10. Which of these statements is/are correct?